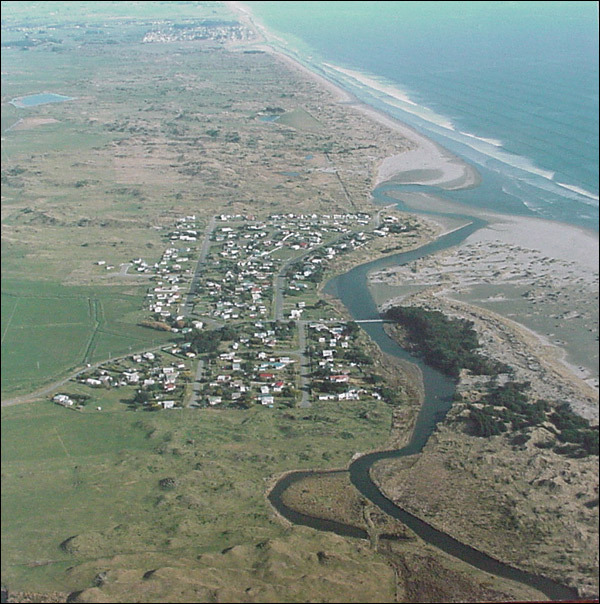 Waikawa Beach lies in Horowhenua — turn off SH1 at Manakau, about half way between Levin and Otaki. It’s a quiet settlement where life revolves around the beach and the outdoors. People enjoy swimming in the river or sea, kayaking, fishing, cycling, horse riding and walking. There are plenty of birds and frogs, and, unfortunately, rabbits. Sometimes you’ll see a small seal or two on the beach. This area has a rich history. Before Māori came to New Zealand moa and Waitaha moa hunters roamed the area, followed by Ngati Mamoe, Moriori. They, in turn, wee followed by Muaupoko from Hawkes Bay. In the 1800 Europeans and Māori alike travelled through and resided in the area. Te Rauparaha made it his base for a while. Late in the 1800s there was farming and flax milling going on, some boat building, trade, and even an accommodation house. 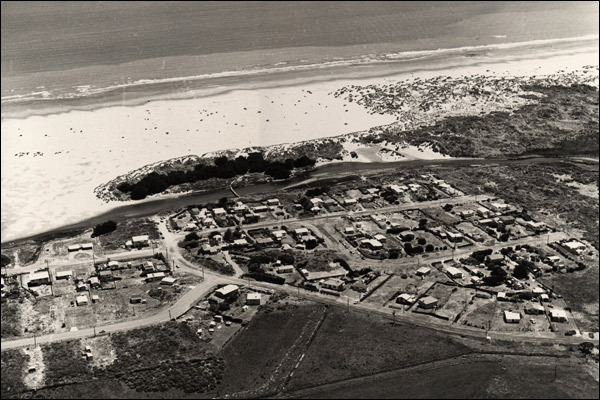 In the 1900s activity at Waikawa Beach dwindled down to farming, but in the later part of the century small baches appeared and it became a little-know but favoured place for weekends and holidays. Source for all the above: Bitter Water, by Deb Shepherd and Laraine Shepherd, published in 1999. Unfortunately the book is now out of print and you can’t buy it. Try your local library for a copy. The library in Levin has it. Looking north along Manga Pirau Street in 2003. 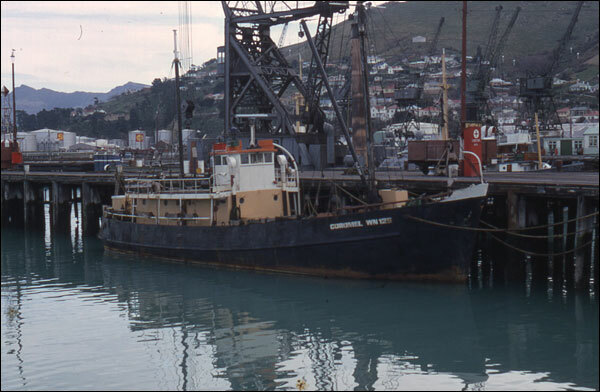 Waikawa Beach in 1972. Note the absence of sand dunes and the position of the old pedestrian bridge across the river. 1. When will the council divert the river mouth on a more permanent basis, and when will there be a more permanent beach access for all vehicles and boats for us permanent residents of Waikawa beach? Please let there be fewer motor vehicles, especially dirt bikes, accessing the beach – for all beach users, especially children. The beach is a legal roadway for all motor vehicles regardless of opinion; it is old fashioned manners that can cause friction among all users. And the only motor vehicles that can legally use such ‘legal roadway’ are vehicles that have a current WoF and Registration sticker and are driven by a licensed driver for that class of vehicle. Many vehicles using the beach don’t meet these standards. So should not be on the beach. 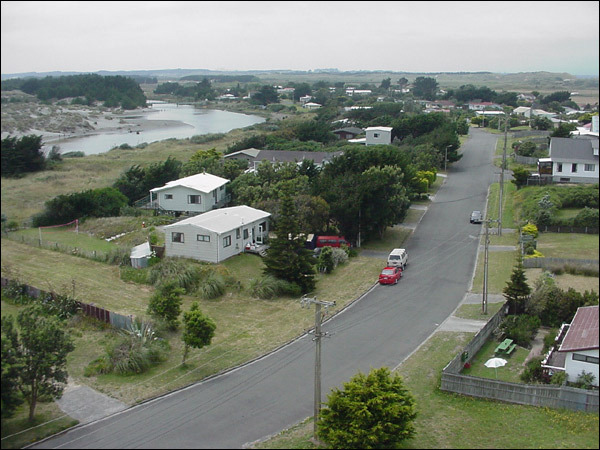 I would say that we are in a far better position than say…Waitarere beach in terms of beach vehicular traffic flows. Most of us do have enough common sense to read the play out here … like life – you will always find something that goes against the grain; it’s how you sort it that matters most. Waikawa beach forever and ever amen! Hiya. Was fortunate enough to spend an afternoon at Waikawa. I flew my drone and met many friendly locals. Here is a video created from video from that day. Hope you enjoy. I borrowed a copy from the Levin library. The book is out of print, I’m afraid, but I’ll ask in the committee if anyone still has copies for sale. There did used to be a couple around. I’m afraid there are no more copies of the book for sale. Try your local library. Will contact Deb Shepard for you and make that inquiry. waikawa beach was a haven for me and my parents and sisters from the 1940s along with Bob Semple with whom we were related. Our small family and friends stayed there continually,eventually living in a bach which my father built at No 1 section on the banks of the river.Our water supply was the artesian bore and we mostly ate flounder,toheroa soup,whitebait and rabbits.The Drake family lived near us and farmed mostly.My father ran a small canteen from our bach which was enjoyed by the few locals. I remember Hank Edwards and his parents having a bach over the road from us later on in years.So many memories of a life of politicians, frogs, fish,freedom and teaching ourselves to swim in that glorious river. Thanks so much for that glimpse into an earlier life Janice. If you happened to have any photos from those times taken at Waikawa Beach you’d be willing to share we’d love to put them on our website. This is such h a special place.